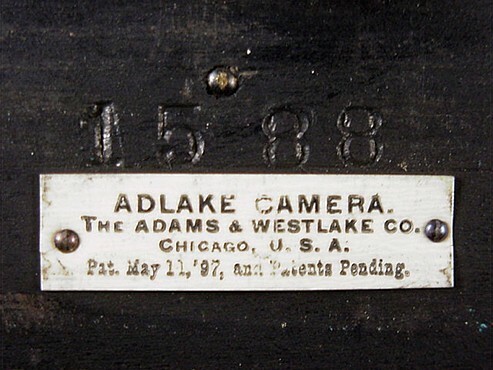 The Adlake is a large leather-covered wooden box camera manufactured by the Adams & Westlake Company of Chicago, Illinois USA, ca 1897. 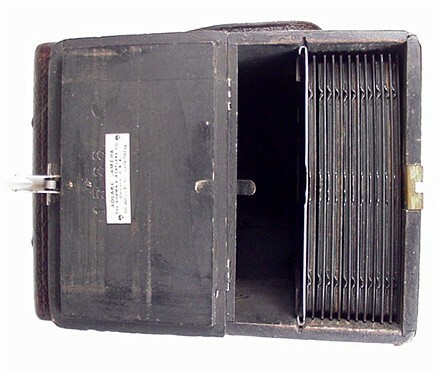 The Adlake camera employs a unique and patented method of providing daylight loading of 4 by 5 inch glass plates. Maybe there is something I am misunderstanding, but I fail to appreciate the advantage of the Adlake daylight loading system. I'll explain myself at the conclusion of this page, after showing how the system works. This is a large, sturdy camera. It weighs 5 pounds on my postage scale, and would be quite a bit heavier were it loaded to its maximum capacity of 12 4x5 inch glass plates. 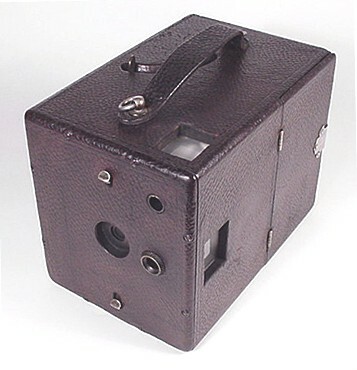 The camera is 7 inches tall, 5 1/2 inches wide and 8 1/2 inches long. The Adlake has two reflex viewfinders, accommodating both horizontal and vertical formats. The shutter can be set for time and instantaneous exposures. Notice a button protruding above the lens opening - this button is set in the up position for instantaneous exposures, and down for time. The button below the lens opening is the shutter release. It is slid either up or down to fire the shutter. Lens aperture and focus are not adjustable. 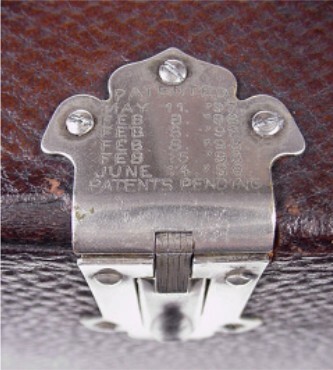 This view of the top of the camera shows a semi-circular cutout with a protruding metal tab. 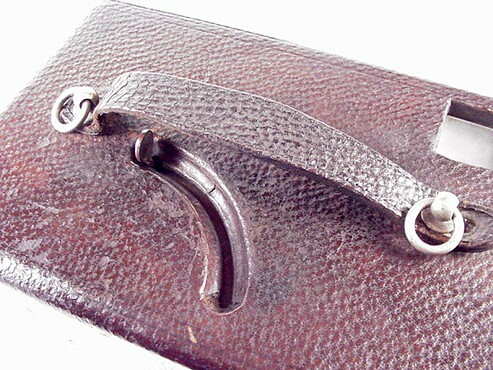 This tab is slid along the arc to open the glass plate holder prior to exposure. Once this is done, the camera is ready for an exposure. This view shows the side plate loading door opened, with 11 glass plate holders in the rear storage compartment. A twelfth holder is in place in front of the storage area, although it is not clearly visible in this photograph. To operate the camera, a holder with an unexposed plate is withdrawn from the storage compartment and slid into the metal frame that separates the camera chamber from the storage area. Then the loading door is closed and the plate opening lever (on the camera top) is pushed to the end of its arc. This causes the plate holder cover to open. The camera is now ready to make a photograph. All that needs to be done is fire the shutter. If this all seems confusing, it may be that I haven't found the right words to explain a fairly simple device. So here is a photograph of a plate holder. It is made of two sheets of metal hinged on one side, that when closed, form a light-tight seal. A photographer would load glass plates into the opened holders in a darkroom, then close the holder to seal out all light. The plate holders could be stored in the camera until time to make a photograph. It is the plate cover that is opened inside the camera when the photographer moves the plate opening lever. After the shutter is fired, the tab is moved back, resealing the plate in the holder. 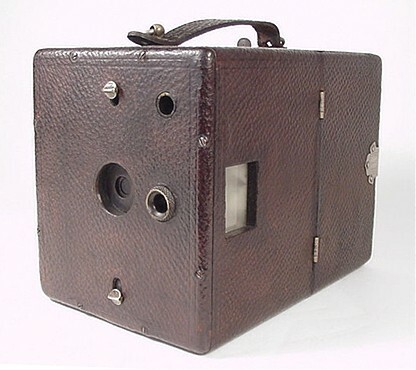 To take another photograph, the camera door is opened, the exposed plate holder is removed and placed at the back of the storage compartment. An unused holder is removed from the front of the storage area and slid into the camera chamber frame. At the introduction to this page, I wrote that I don't understand the advantage of the Adlake daylight loading system. However, I do think that the light and thin metal plate holders were an improvement over the usual thick and heavy wooden holders of the period. But why design the camera and holders in such a way that a lever mechanism is required just to uncover the glass plates? Why not design metal plate holders with a standard dark slide feature? Isn't it as convenient, or nearly so, to pull a dark slide from a holder as to push a lever? 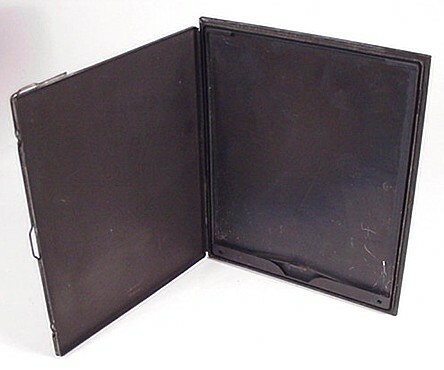 Dark slide holders were loadable into cameras in the daylight, the same as Adlake holders, and both types of holders required darkroom loading of the plates. What was the Adlake advantage? By following this link you can view a copy of the Adlake patent. I've read the patent, and I still don't understand why this odd camera design was marketed.